The saying “knowledge is power” is as true today as it ever was and we’ve got the tools to empower you when it comes to your electricity usage and bills.Pinergy’s Smart App and In Home Display helps you identify why your energy bill might be running high. By arming you with real-time data, you can learn how to alter your behaviour to make sustainable changes and lower your energy bill.Read on to discover how Pinergy’s smart technology can help you cut your electricity costs. The saying “knowledge is power” is as true today as it ever was and we’ve got the tools to empower you when it comes to your electricity usage and bills. Pinergy’s Smart App and In Home Display helps you identify why your energy bill might be running high. By arming you with real-time data, you can learn how to alter your behaviour to make sustainable changes and lower your energy bill. Read on to discover how Pinergy’s smart technology can help you cut your electricity costs. As a Pinergy customer, your Smart Energy App and In-Home Display allows you to understand and monitor your home’s energy usage and modify your usage to make savings. Armed with real-time information, you can see exactly how much electricity you’re using at any given moment. By actively monitoring your devices, you’ll be able to identify trends or spikes in your energy usage and make appropriate changes. At Pinergy, we encourage customers to achieve savings by making small changes, which have a big impact on energy costs. Here’s some tips on how to get the most out of the smart technology you could have at your fingertips. As most of us learned from a young age, the minute your older siblings or cousins turned a boring sounding job they needed you to do, into a competition, it suddenly became a top priority! The Pinergy Smart App introduces a level of friendly competition which can provide a little extra motivation to make those all important changes to how you use your home electricity. Through the app, you can compare your home electricity usage with other similar homes, giving you a useful benchmark to target. Sometimes, the psychological drive to compete with your own high standards can be even stronger than the urge to compete with others. 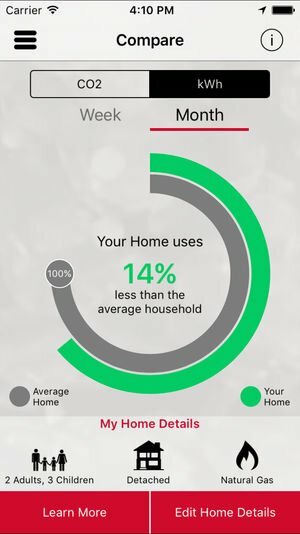 By tapping the History icon on your In Home Display, you can assess your current usage compared to your past performance over the previous day, week or month. You can also set a daily target threshold to suit your home and aim to stay within this threshold. This kind of self-awareness makes it easy to nip any new wasteful energy usage habits in the bud before they cost you down the line. One of the most attractive features of having Pinergy as your electricity supplier is the real-time control you have over your money. Through the app, you’re never more than a tap away from seeing your current balance for your home electricity. When you have the ability to top this up in an instant, anywhere, anytime, you are empowered to gradually fund and optimise your electricity usage, rather than blindly using energy guzzlers in the home, unaware that you have a nasty surprise in store 2 months down the line when you open your energy bill. Similarly, you can leverage full control over your spend by scheduling top-ups for regular intervals that suit you. 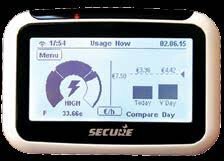 This allows you to self impose a monthly budget, while remaining safe in the knowledge that should some unforeseen reason for increased energy usage occur, you can easily top up as required. The user experience of the Smart App and In Home Display could not be further removed from that of your traditional monthly bill. With the Pinergy App, you can flip how you view your energy consumption from KWh, to CO2 to Euro. Plus, being able to view these figures in real-time opens up opportunities to learn a lot more about where your KWh, CO2 or Euros are being spent and saved. Ever wondered what impact your new fridge freezer or your new LED lighting set up has had on your home energy efficiency? (By the way, don’t hesitate to contact us about how we can support you in getting equipped with LED home lighting and saving up to 80% on your lighting costs.) Well, now you can see precisely what the impact is. Check your In Home Display and make note of your KWh usage before you make the switch. Then, without turning anything else in the house on or off, plug in your new appliance in place of the old one and see the difference right there and then. By going Pay As You Go with Pinergy and our smart technology, if you are sharing accommodation, multiple individuals can contribute payments into the same account. This way you can manage who pays what and when, so no more arguments over bills. Your home’s ‘base load’ is the minimum amount of electricity your home needs to run on when no one is there. Once you know what this should be, you can easily spot when something’s running when it’s not supposed to be. Switch off everything, excluding essential appliances like your fridge. On your In Home Display, press ‘Menu’ followed by the electricity icon twice to store this minimum required KWh usage for your home. This is your base load. About 80W, or 0.08KW, is a reasonable average for a home to run when no one is there. Now that you know your base load, you can check your In Home Display any time you are about to leave the home for any significant period of time, such as heading off for a long weekend away or your summer holidays. If you notice your home is running above your base load, this is an indication that you’ve left something on by mistake and gives you the chance to switch it off and enjoy your trip with total peace of mind. Interested in making sustainable changes to the way you use electricity, which will help the environment and lower your energy costs? Switch now and become a Pinergy customer today.